Provide software-led, digital transformation with Pivotal’s cloud-native platform. Build, run, and scale modern apps with the powerful combination of Pivotal Cloud Foundry on GCP. Deploy to production thousands of times a month. Tap into Google’s advanced data and analytics services natively in Cloud Foundry via the GCP Service Broker. And do all this knowing your apps run on the same Google infrastructure that powers Search, Maps, and YouTube. Google engineering has worked extensively with Pivotal to ensure PCF on GCP is enterprise-ready and highly performant at any scale. Enhance your cloud-native apps on PCF with Google’s advanced data and analytics services. 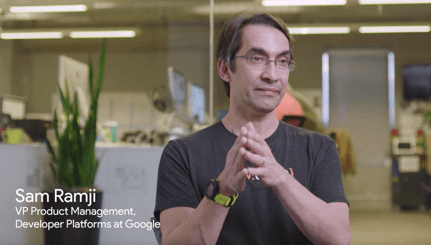 The GCP Service Broker delivers lifecycle management and secure connectivity to many of our flagship services. Digital transformation is a challenge. Lean on the experts at Google and Pivotal to help you every step of the way by combining Pivotal’s enterprise cloud-native platform with Google’s 15+ years of cloud experience. Pivotal Cloud Foundry deploys on GCP quickly and easily. With features like 30-second VM boot times, your build pipelines can finish quickly so you can get to production faster! Google Cloud’s pricing model is extremely customer focused. From per-second billing and sustained use discounts, to pre-emptible VMs and committed-use discounts; your PCF workloads will be more cost effective on GCP. Both Google and Pivotal support open standards and open source extensively. We continue to collectively invest and contribute to Cloud Foundry, Kubernetes via Kubo, the Open Service Broker API, and Istio. And we continue to collaborate in deep and meaningful ways. A discussion between James Watters, SVP of product at Pivotal, and Jay Marshall, Enterprise Cloud Acceleration of Google Cloud Platform, discuss how Google Cloud Platform and Pivotal Cloud Foundry are working together. Google and Pivotal engineering teams have collaborated across the board to deliver deep integration between Pivotal Cloud Foundry and Google Cloud Platform. From the lower-level BOSH integrations, to the custom GCP Service Broker , integration with Stackdriver, and even Pivotal themselves going through CRE review; the Google and Pivotal teams have been pairing relentlessly to ensure Pivotal Cloud Foundry and Google Cloud Platform provide a premium solution for our joint customers. Many of Google Cloud Platform’s core platform features provide true differentiation under Pivotal Cloud Foundry. Things like per-second billing and 30-second boot times mean that you can deliver software much faster and at a fraction of what you are used to.And leveraging Google’s Global Load Balancing means that you can go from zero requests per second to a million requests per second…in mere seconds. And all of the above runs on Google’s own backbone, which means low latency across all of your workloads, even across regions. Use innovative data services like Spanner in your cloud-native apps. Run your PCF instances across multiple regions, while accessing the same distributed SQL database. You can now access some of Google Cloud’s most compelling services via the Cloud Foundry service broker. Google BigQuery, Google Cloud Storage, Google Cloud SQL, Google Cloud Pub/Sub, Google Cloud Vision API, Google Cloud Speech API, Google Cloud Natural Language, Google Cloud Spanner, Google Cloud translate API.